So, Wall Street is struggling, every time we turn around there's another bank failure, and Congress has pretty much decided to let the automakers fail. Seems that the malaise is spreading up the ladder, too. Suppose you were part of Bush's base, and maybe you're having a little Christmas guilt. So, you make some big charity donations to make yourself feel better. You'd hope that maybe the money would do some good, right? WRONG! Some of Boston's wealthiest and most prominent philanthropists have lost millions of dollars to a Wall Street investor accused of running a $50 billion Ponzi scheme, a case that has already shuttered one foundation and could hurt nonprofits in medicine, education, and the arts. Bernard L. Madoff, a former chairman of the Nasdaq Stock Market, was arrested Thursday in Manhattan and charged with securities fraud by federal authorities. His clients include philanthropists Carl and Ruth Shapiro, major donors to the Museum of Fine Arts, Brandeis University, and Beth Israel Deaconess Medical Center. The Shapiro family foundation lost almost half its money, or about $145 million, to Madoff. Other clients include Avram and Carol Goldberg, former owners of the Stop & Shop supermarket chain, and Stephen A. Fine, president of Biltrite Corp. in Waltham. In Salem, the Robert I. Lappin Charitable Foundation, a private family organization that financed trips for Jewish youth to Israel, said it was forced to shut down and lay off seven employees yesterday after losing all of its estimated $8 million to Madoff. The foundation also supports Jewish educational and cultural services on the North Shore. Lappin lost personal funds as well. "We are all devastated," said Deborah Coltin, executive director of the Lappin foundation. "You put your faith in someone. It turns out to be a huge scheme." Authorities say Madoff confessed to effectively paying one set of investors with money he took in from others. Speaking of change, let's change gears! Many of us Christians are gearing up for the major holiday of the year in just a few days. Our Semitic friends are readying for Hannukah to start at sundown on December 22. But what about the third Abrahamic religion? Our Muslim brethren have just completed the Hajj, the annual pilgrimmage to Mecca by having the four-day feast of Eid-al-Adha. Finally today, we'll stay with the religious theme and check in with the region's largest faith...Red Sox Nation. Earlier in the week, the Red Sox announced some new alternate home and road uniforms. To this learned eye, the logo doesn't look much different from the current one, and they're moving away from the traditional road grays to a snazzier dark blue, and a bright red uniform for some home games. But why would the Sox toy with arguably the best-known logo of one of the oldest and most storied franchises in baseball history? Back around November, the Sox announced that they would "hold the line" on ticket price increases for next season. So, instead of coughing up $5 extra dollars per seat for the one or two games we might go to next year, the average fan will shell out hundreds of dollars to outfit themselves in the new gear. Very shrewd, indeed. 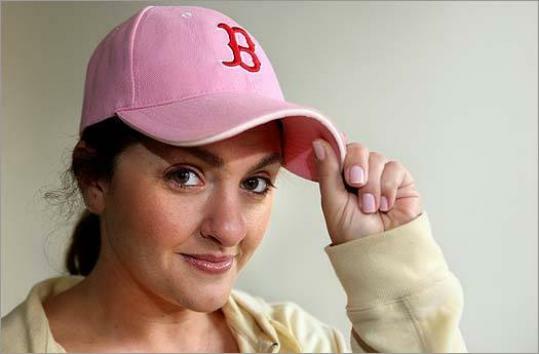 Of course, that doesn't address the "pinkhats", as us die-hards derisively call the fair-weather fans that have outfitted themselves in nontraditional alternate colors. So....It's Saturday, I'm working this afternoon, so I hope we'll all get along without a hard-hitting blog. Gotta take it easy every now and again, hmm?